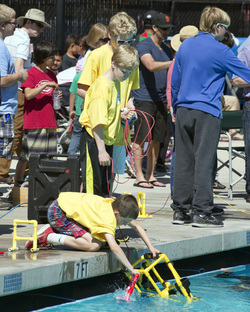 (ROVs) to compete in a competition in April or May. The event includes underwater missions, a poster display, and an engineering presentation. Scout is open to everyone (Junior High and High School). This class is taught by Mr. Hagen on Thursday's 12:30-2:00pm. Initially class will be on-sight. We will be transitioning to a local pool for testing. REQUIREMENTS: Students and Parents must attend the informational meeting or meet with Mr. Hagen to understand the class and commitment needed. Here are some more specifics to the class and expectations. Expected Goals: To see a list of goals for this class click here. Note that this also lists goals for the Navigator and Ranger (advanced) ROV level.